Hi there, I’m Kathy. After almost 20 years living in La Belle Province (Quebec), we (my husband Francois and I) have moved back to Nova Scotia, that beautiful province on the east coast of Canada. Just because we are settling into this wonderful country life in our little 88 year old home by the sea doesn’t mean that I’ll stop dreaming up, creating and blogging about new and easy recipes for you to try. No way. 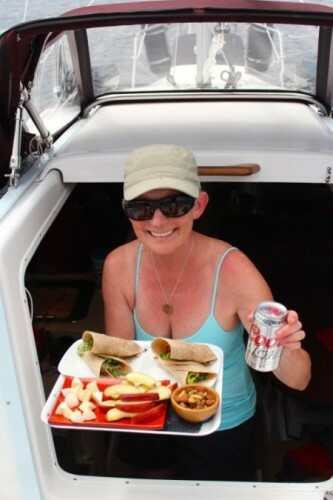 We will still spend summers aboard our 26 foot sailboat, me, as Co-Captain, Chief Communications Officer, blogger and of course Galley Kat, creating simple dishes in my tiny boat kitchen. In the winter months, I exchange my boat hat for a warm tuque, continue to dream up new recipes, testing them out in my land-based kitchen to make sure they can be reproduced in our summer tiny living space. Managing my own dot com and all that it involves has been a steep learning curve but so far I’m enjoying my new-found geek skills. Learning to sail was by far so much easier. Welcome aboard my Galley Peeps and bon appetit!